Also known as Schwarzer Adler. A little too thick and malty pale beer. My wife is from Dörfleins Germany. We go over there every year to visit her relatives. Always stop in at the Brauerei Eichhorn a half dozen times or more every time we are over there. Love the place. Been going there on and off for 30 years. Greatest beer ever. Excellent dark beer, nice location and if you're looking for something light to eat a great place to spend a warm summer evening. 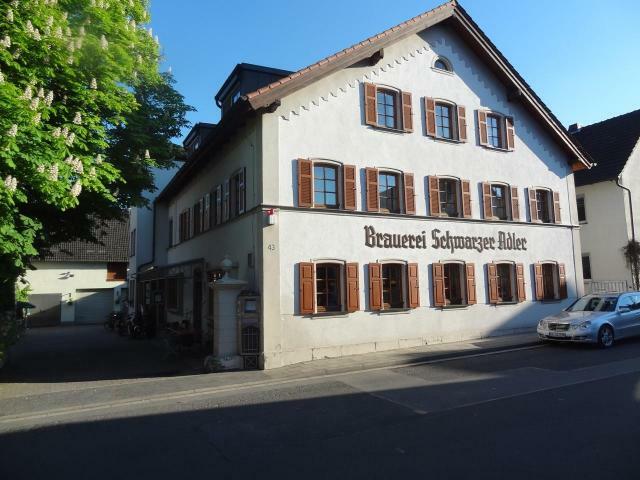 Great brauerei. I have been there twice and loved it both times. First time had the bock and it was very good. Yesterday had the keller and it was very refreshing after a bike ride. If there's a franconian version of an 'Einheitsbier', that's it. The place is busy, as it is very close to the city of Bamberg. But the beer lacks of taste and character, that's compensated by lots of co2-bubbles. I have to admit, I didn't like it. This is a classic pub that's easy to reach from Bamberg. The Kellerbier is delicious and had me ordering another although I usually try to drink the range. The Bockbier was light and dangerously drinkable. I shall return! A hidden gem, a short bus ride from Bamberg town centre. You could drink the lagerbier all day long (which is what the locals do) . We stayed in Dorfleins for 2 weeks, so Eichorn was our local. Not sure what to say about it; ut's a really nice place but limited and, often, erratic opening (often, they just don't seem to bother) and, perhaps, not the friendliest and most welcoming of hosts. The beer is good enough: a lightish but tasty kellerbier and quite a good pils. Go and see for yourself but check before that they are open. While you are in Dorfleins, if the weather is good and it's the season, visit the Diller keller for some Honig from Tiefnellern (signpost right immediately after you cross the Maine bridge). Lovely and very friendly keller. Which number is lowest 3 or 44?